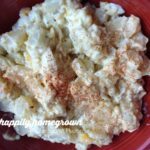 Homemade Egg Potato Salad delicious enough to impress company, and easy enough to throw together for any picnic or potluck. In a large mixing bowl, combine the potatoes, hard cooked eggs, and onion. Make sure all of your pieces are bite-sized or smaller. In another bowl, whisk together the mayo, relish, dijon, oregano, and lemon juice to make the dressing. If you don’t have relish, you can finely chop a few pickles instead – no matter the variety! Gently, dress the potato salad by folding everything together. Be careful not to crush your potatoes. Taste, and adjust seasoning to meet your needs. Chill for 2 hours before serving so all of the flavors have a chance to come together.